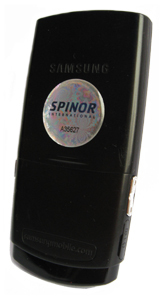 The Spinor device provides reliable and user-friendly protection from adverse effects of the torsion (information) component of electromagnetic radiation of mobile phones, cordless phones, MP3 players, laptops and other electronic devices. Recent studies revealed that the torsion (information) component of radiation of mobile phones (cordless phones) is the most substantial factor affecting the human health. Prolonged exposure of the torsion (information) component of mobile phone’s radiation can deteriorate one’s health, cause headache, excessive fatigue, weak vision and memory, sleep disorder, reduction of the blood levels of leukocytes and lymphocytes, immunity disorders; it adversely affects the endocrine and reproductive system. Children and pregnant women are most vulnerable to effects of torsion (information) fields. The Spinor device neutralizes harmful effects of torsion (information) component of radiation of mobile phone (MP3 player, laptop etc.) and creates a biologically safe area around a phone (any other electronic device). The device does not interfere into operation of phones and other electronic devices.